So I've just started to look at what I collected in London last month, but I've actually been thinking about and playing with cognitive maps for the past year or so, and I've got some preliminary analysis already. Primarily, what I see in the maps that I collect from undergraduates, post-graduates, and faculty/academic staff are learning landscapes. There is much talk of learning "spaces," but I think the problem there with that terminology is that they can be thought of too easily in isolation. "Landscape" implies a network of spaces, with a relationship to each other. Some landscapes are extensive, some are relatively local and limited, but they are all networks, and involve buildings, people, technology, modes of transportation, institutional spaces, commercial spaces, domestic places, and so on. The reasons that people locate themselves in particular places tend to have less to do with the absolute qualities of a particular place, and more to do with a complex calculus of motives, including not just what they want to do in that place, but where they need to be beforehand, and after, with whom they will be (or want to be, or cannot be with). The map above was generated by a 3rd year student in Project Management for Construction. 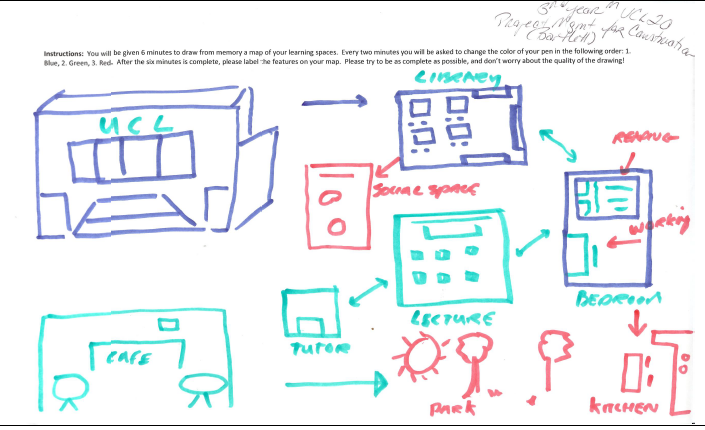 He has drawn UCL on the left, and then broken UCL down into the various institutional spaces he visits for his academic work (the Library, lecture halls, tutors' offices). These institutional spaces are embedded in a larger network of cafes, domestic spaces, and even (weather permitting) parks. This MA student in Russian literature has spaces all over London in her map. 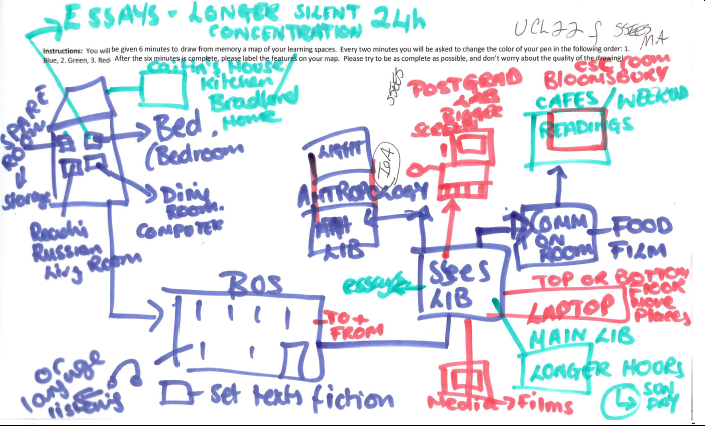 Her home has sub-areas she has identified for particular sorts of work, her commute on the bus is earmarked for certain sorts of reading or listening work, and the UCL part of her map includes not just the SSEES library (ostensibly, her academic "home"), but also the Institute of Archaeology library, the Post-graduate common room, the Main library, and various cafe spaces. She has called out her laptop in the UCL spaces as a crucial part of her landscape. This faculty member in the Institute of Archaeology has separated his London landscape from his other significant locations, and has included labels for London libraries (the British Library, Senate House, the IoA Library, and in particular the Wellcome Library, limned in red), antiquity societies and museums, the Tube, and his office in the IoA. Cambridge is important because of its connection to his brother as much as it is for its academic resources. Yale's Beinecke gains additional importance because of New Haven's pizza. His home setup is represented by him in an armchair with his laptop and a cat. What strikes me most about these maps, especially given that I followed up the mapping exercise with a structured interview (modeled on the V&R instrument) is the relative lack of representations of "the digital." We get some tools (computers, iPods, phones), and occasional representations of places/services such as Dropbox or Evernote, but in general, the digital is shot through these, but invisibly. If I were to try to layer "the digital" onto a map such as this, it would simply light the entire thing up. I want to pause here and note that when I first heard "post-digital" in conversation with Lawrie Phipps and Dave White, I was incredibly annoyed. What on earth could they mean by that? It smacked of "post-racial," which in my experience is a phrase used by people keen to deny particular sorts of realities. But these maps, and the interviews that accompanied them plus the last 3 years (yikes) I've spent working on the Visitors and Residents project have apparently made me less resistant to the idea of "post-digital" than I would have been if I'd heard about it when the 52 group (Dave Cormier, Richard Hall, Lawrie Phipps, Dave White, Ian Truelove, and Mark Childs) came up with their concept paper in 2009. I think I have post-digital learning landscape maps here. The digital is just understood. It's water to these academic fish. And it's not just academics; people generally take the digital so much for granted, that when we ask them (as we do in the Visitors and Residents structured interviews) to think about what they do "with technology" or "on the web" they are taken aback, they have to think about disentangling it to talk about it separately, because their everyday practices are so completely wound around digital tools and places. The role of the digital is practically unspeakable, we in our interviews are asking them to describe what it's like to breathe. And when people do talk about technology, it takes very few sentences indeed for them to switch over to talking about people, or information--that is, the stuff they are accessing via technology is far more important, and far more the point, than the technology itself. "Not only is the digital subservient to the social, it is, in some ways (and soon most ways), transparent. We are moving towards a postdigital age where the tools driven by the microprocessor are common to the extent to which they will no longer be noticed. As the 'digital' calculator and the 'digital' watch have become calculators and watches, so will the ebook become a book and IM become 'message': the 'instant' will be taken for granted. Things digital will be accepted alongside our other technologies and the slate swept clear of many of the distracting dualisms (and technological factions) that pervade the educational discourse. The postdigital frees us to think more clearly and precisely about the issues we face, rather than become tied to an obsession with, and the language of, the new." Interesting post Donna. I wonder about our association of maps with physical buildings and places. We know how to draw a cafe and a library (although the words would be enough), but what those drawings/words represent may have changed. Do we know how to draw the digital in the same way? Phil, sometimes they do draw in computers, and we have maps where (as I noted above) they mention the importance of Evernote, or Dropbox. I think you're right, it's difficult to visualize "the digital" in the same way, but it's representable (I think that might be a word)--as evidenced with the Visitors and Residents mapping exercises, where all they are mapping is the digital. I think it would be very interesting (if time consuming) to ask people to map themselves in terms of their digital practices and their physical practices all at the same time--some of the work-flow mapping that has taken place in other projects (like Lesley Gourlay and Martin Oliver's work) gets at this relatively effectively. 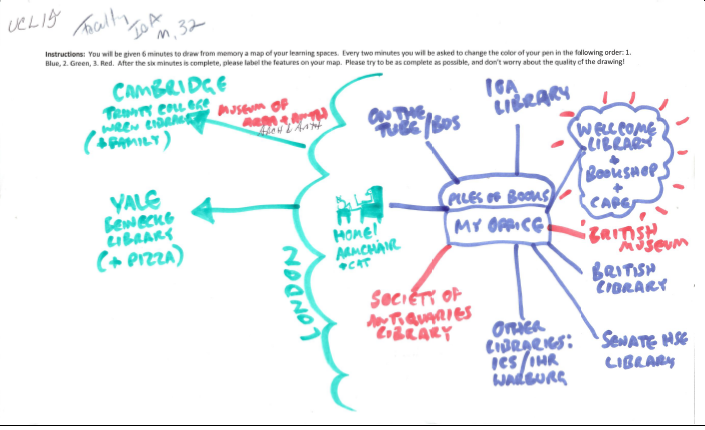 For me, it's the combination of the physical mapping exercises with the content of the interviews (which asks about digital engagement, among other things) that makes me think about the cognitive maps as post-digital. But I do think that's mostly a descriptive term--it's possible something like Actor Network Theory will get me closer to effectively thinking about why things look the way they do. This blog is being used for research purposes, and your comment may be used in discussions and/or publications regarding research on patron work habits in the Atkins Library. Please keep comments clean and constructive. Donna Lanclos has been the Library Ethnographer at the J. Murrey Atkins Library at UNC Charlotte since 2009. Her research interests include the nature of information seeking behavior, as well as the relationship of the needs of instructors and learners to the physical and virtual spaces of academic libraries, and in higher education generally. She has done research at University College, London, as well as in and around the UNC Charlotte campus. Dr. Lanclos' training is in folklore as well as socio-cultural anthropology, and she earned her Ph.D. in Anthropology from the University of California, Berkeley, in 1999. Her research on the folklore of primary school children in Northern Ireland was published in 2003 by Rutgers University Press as At Play in Belfast: Folklore and the Formations of Identity in Northern Ireland. She has published several articles in LIS, IT, folklore, and anthropology journals concerning her research. In addition to her anthropological research, Dr. Lanclos is known for her inordinate love of boots and other fabulous shoes. DISCLAIMER: Representatives of a North Carolina state agency communicate via this Web site. Consequently no person communicating via this site (whether a state employee or the general public) should have an expectation that any communication on this site is private. All communication on this site may be subject to disclosure under the North Carolina Public Records Act.